HMT Recruitment is a job advertisement with the name HMT Machine Tools Ltd has been encouraged to inform the goal-oriented and skilled competitors for 43 General posts of General Manager, DGM, JGM, Manager. Eligible job seekers can apply for HMT vacancy by filling offline application form before the deadline of 26 November 2018. Education criteria: Those job hunters did the engineering degree (Mechanical / Electrical / Electronics) / MBA / PGDBM (Marketing) / CA / CMA / ICWA / Bachelor's Degree (Commerce) / MBA / PGDBM (Human Resources / Personnel Management / Industrial Relations) is. / Labor welfare / labor management / labor administration / labor study from recognized university or institute may apply). Applicants who are interested in applying for the above mentioned position should not be 50 years or 45 years (post 1), 45 years or 40 years (post 2), 34 years or 30 years (post 3), 45 years or more than 40 Should be year or 36 years (post 4), 34 years or 30 years (post 5), 40 years or 36 years (post 6). Pay structure: After qualifying the selection process, the competitor who receives the shortlist will be charged Rs. 20,500 - 26,500 / - (post 1), Rs. 18,500 - 23, 9 00 / - (post 2), Rs. 13,000 - 18,250 / - (post 3), Rs. 18,500 - 23, 9 00 / - (post 4), Rs. 13,000 - 18,250 / - (5 posts), Rs. According to organization norms, 16,000 - 20,800 / - (6 posts). The classification of job seekers for the above positions will be based on screening and their attendance in personal interview which will be organized by HMT Machine Tools Ltd on the scheduled date. Job seekers are interested in applying for the above mentioned positions, first of all they need to go through the official website which is http://www.hmtmachinetools.com. Click HMT Recruitment Notification here. An Employment Notification has been disclosed regarding the HMT recruitment by Hindustan Machine Tools Limited to inform hard working and result oriented job applicants for 05 posts of Assistant General Manager, Deputy General Manager. Eligible contestants can apply for HMT vacancy by submitting their prescribed application form before the last date of 31st October 2018. Applicants should not exceed 40 years or 36 years (post 1), 36 years or 34 years (2-5 posts). Salary / Salary Band: The candidates selected for Assistant General Manager, Deputy General Manager, Salary Pay Bands Rs. 32, 9 00 - 58,000 / - or 29, 100 - 54,500 / - (post 1), Rs. 29, 100 - 54,500 / - or Rs. 24, 9 00 - 50,500 / - (2-5 posts). First, go to the HMT web portal, which is http://www.hmtindia.com. Application latest to be sent: 31-10-2018. 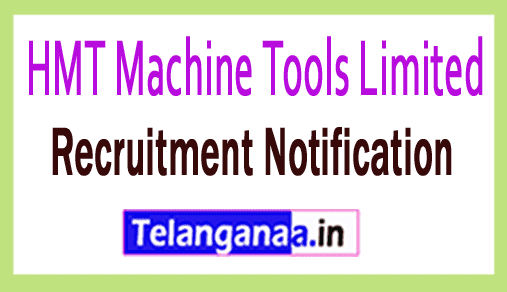 HMT Machine Tools Limited has issued a latest job notification regarding HMT recruitment to inform achievement oriented and skilled Indian citizens for 02 posts of Executive Associate / Executive Consultant. Eligible Job Hunter can apply for HMT vacancy by submission of application form through offline mode before the October 10, 2018 deadline. Essential Qualifications: As per applicable knowledge, job seekers should complete education as a B.Com with computer knowledge / bachelor degree / diploma (civil engineering) with good academic records from well-recognized university / institute. Applying for the candidates should not be above 62 years of age. Salary details: Successful recruitment candidates will get the salary of rupees. Rupees. 36,500 / - or 40,000 / - from recruitment organization. Process of filling the HMT application form? First of all the claimant goes to the official website which is http://www.hmtindia.com. A list of this latest opening link will open and the candidates will have to choose the most appropriate link, which will open the entire ad with more information about HMT vacancies. Once filling the application successfully, Indian citizens should send it with supporting documents and certificates to the address given below before the deadline. The last date for receiving the hard copy of the application form is: 10-10-2018. Click HMT Recruitment Notification here 1. HMT Machine Tools Limited has posted a vacancy notice for HMT Recruitment to inform the enthusiastic and talented candidates of the Executive Associate positions. Applicants can apply for the HMT body by submitting the application form before 30 July 2018. Education Criteria: Applicants must have employees B.Com / ex, Retired / Retired Services HMT Limited and its affiliates / subsidiary units for the post of Tech / Office / Exe from a University / Institute through the recognized publication. Applicants wishing to apply for the above publication must be under 61 years of age. What can I get as a pay band ? : Candidates who are successfully recruited receive an attractive and satisfying salary of Rs. 20,000 / - from HMT. Competitors wishing to oppose the hiring of HMT Machine Tools Limited must undergo the merit round, past service registration and suitability organized by the organization recruitment panel. First, the applicators must open the official website of the organization http://www.hmtindia.com. Last deadline for receiving applications: 30.07.2018. Qualification : Diploma in Mechanical or ITI in relevant discipline or SSLC with 50% and above marks. How to Apply : Interested candidates may apply in prescribed application form along with self attested photocopies of the relevant certificates in proof of qualification, age, category, experience etc., and affixing latest passport size photograph send by post/courier to The Deputy General Manager (HR), HMT Machine Tools Limited HMT Colony P O, Kalamassery, Ernakulum Dist. 683 503Kerala, India. on or before 24.02.2018. Qualification : BE/B.Tech/Diploma in Mechanical/Electrical or ITI in applicable subject or MBA in HR. Application charge : There is no application price. Ernakulum Dist. 683 503Kerala, India. On or before 27.01.2018.